It seems that these days that you can find a coach for just about anything. Career coach? Check. Fitness coach? Check. But life coach? Let’s hear what winemaker Rich Estrin of Estrin Estates has to say. As the group prodded the woman about her new profession, she asked Estrin two provocative questions as an example. The first - “If you could do anything you wanted, what would it be?” Estrin said make wine. His friend then asked a very simple but pointed question – “What are you doing today to help reach that goal?” Estrin had no answer. “It was quite moving at the time,” he says. That simple question spurred him into action. “Literally the next weekend we had found a source for grapes on Craig’s List and drove out to this place in the middle of nowhere.” It turns out that the place in the middle of nowhere was Mike Wade’s (Fielding Hills) RiverBend Vineyard on the Wahluke Slope. “Violet and I loaded up the minivan and drove out to Mattawa for the first time,” Estrin says. “Brought our clippers and harvested our first 200 pounds of Cabernet and Syrah.” Estrin made the wine in carboys that year. “At the time I thought it was the greatest stuff that had ever been produced,” he says with a chuckle. Estrin says that his initial interest in making wine was driven by a love of craft, a passion that first started in the world of computers where Estrin continues to make his living today as an engineering manager. In fact, Estrin and I used to work together in a former life many years ago, so I was pleasantly surprised when his Cabernet Sauvignon bubbled up in a recent blind tasting. “I was a computer geek in the 6th grade,” he says. “The Commodore 64 era. That’s where it started. Creating things and making things happen through code.” Over time, that interest in making things has led Estrin in a number of different directions. “Whether it was bicycle wheels in college or making beer after college or golf clubs. Whatever I get interested in and passionate about I want to learn the craft of it,” he says. 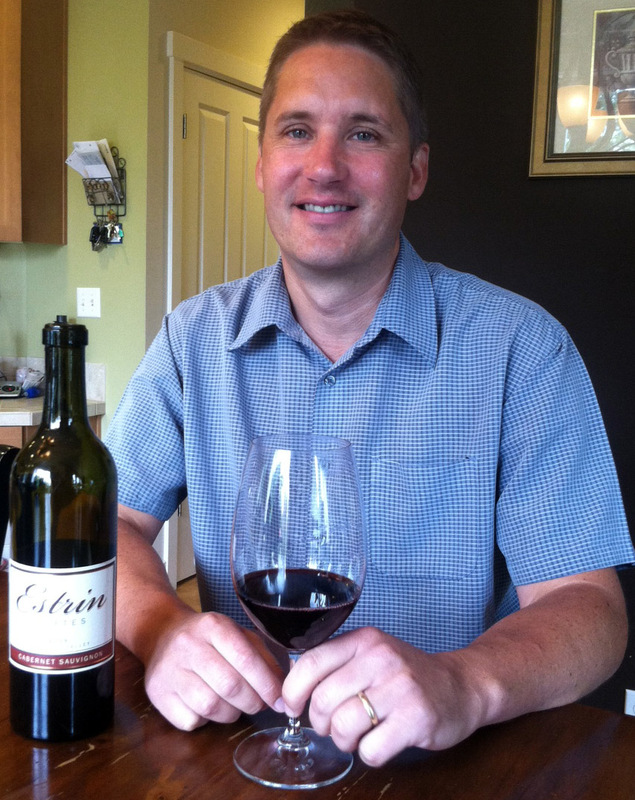 As he has progressed, Estrin says the cooperative nature of the Washington wine industry has also helped him on his way. He has peppered winemakers, such as Kurt Schlicker at Rulo Winery and Trey Busch at Sleight of Hand, with questions. “Those guys were very forthcoming with what they’re doing,” he says gratefully. For now, the winery remains a hobby, and Estrin has no plans to quit his day job. Over time, the winery has slowly taken up more and more of the basement of his Issaquah home, going from several carboys to one oak barrel to now many oak barrels. Indeed, like many new winemakers, Estrin says that the challenge for a small producer is selling the wine. “It’s certainly not a Field of Dreams - you make it and they will come,” he says of his experience. “It takes a different personality skill set to sell wine than to make wine.” The most important piece of advice he has for someone getting started? “You have to pour your wine for people who will buy it!” he says. For now, though, Estrin is content to grow slowly and explore the craft of winemaking. And as for ‘life coach,’ let’s just say that no one is laughing anymore. (Good) A moderately aromatic wine with fresh cranberries, cedar, roasted coffee bean, and black cherry. The palate is plush and silky with abundant cherry flavors and oak accents. 76% Merlot, 21% Cabernet Franc, 3% Cabernet Sauvignon. RiverBend and Stoneridge vineyards. Aged 22 months in American and French oak (50% new). 13.2% alcohol. 33 cases produced. Sample provided by winery. (Excellent) An aromatically alluring wine with high toned herbal notes, cherry, cocoa, and roasted coffee bean. The palate is concentrated, fresh and clean with well integrated tannins. 85% Cabernet Sauvignon, 12% Cabernet Franc, and 3% Merlot. RiverBend and Stoneridge vineyards. Aged 22 months in French oak (100% new). 14.2% alcohol. 44 cases produced. (Good) Moderately aromatic with spice box, cedar, coffee bean, pencil lead, and bright cherries. The palate has soft, expressive cherry flavors with abundant oak accents and smooth tannins. 100% Syrah. RiverBend Vineyard. Aged 22 months in French and American oak. 13.5% alcohol. 25 cases produced.